I used to paint a lot of food still life paintings but this was "totally" different and such a challenge. 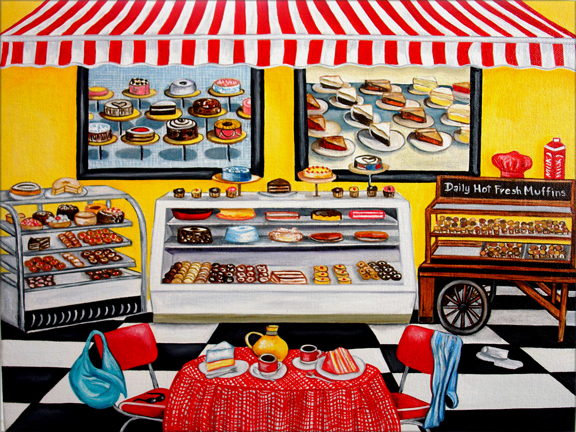 Most of my most recent food paintings are 16 x 20 and larger and were one or two items. In How Sweet It Is, everything is tiny, tiny! 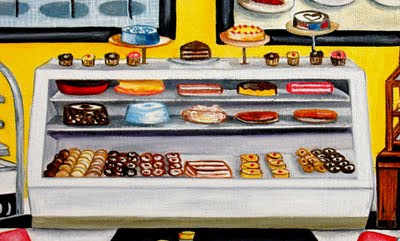 I always wanted to paint a bakery and just love Wayne Thiebaud's pastries and goodies. 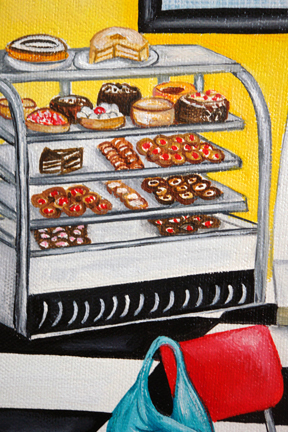 Thiebaud used very thick layers of paint and painted very large so the paint actually looked like frosting. Of course these renditions of his goodies are so small that I could not use that technique. 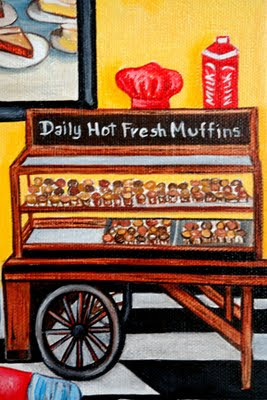 However, I crammed as many of his works in to this little bakery as I could and Oh Boy, did it take a long time to do all that detail! I think using the check floor and table cloth and the old chrome kitchen chairs was a great fit for this composition. I have included several close up shots here for the details. Enjoy! 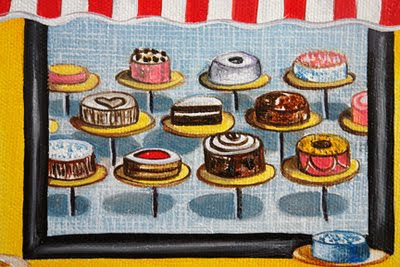 Wayne Thiebaud (born Mesa, Arizona, November 23, 1920) is an American painter whose most famous works are of cakes, pastries, boots, toilets, toys and lipsticks. His last name is pronounced "Tee-bo." He is associated with the Pop art movement because of his interest in objects of mass culture, however, his works, executed during the fifties and sixties, slightly predate the works of the classic pop artists. He has also been seen, due to his true to life representations, as a predecessor to photorealism. Thiebaud uses heavy pigment and exaggerated colors to depict his subjects, and the well-defined shadows characteristic of advertisements are almost always included in his work. Wayne Thiebaud is one of the most prominent of the Bay Area Figurative Movement in California in the latter part of the 20th century. He spent time in New York City where he became friends with Willem De Kooning and Franz Kline and was much influenced by these abstractionists as well as proto pop artists Robert Rauschenberg and Jasper Johns. During this time, he began a series of very small paintings based on images of food displayed in windows, and he focused on their basic shapes. 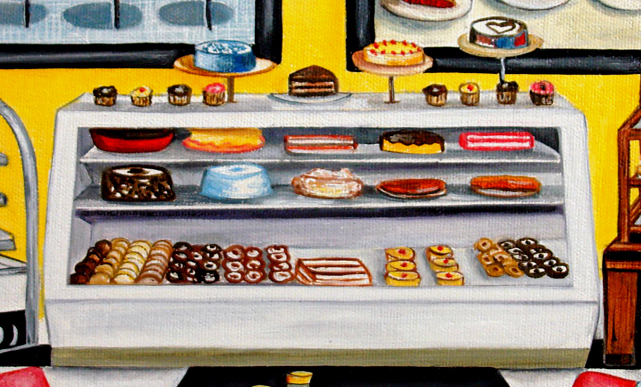 Thiebaud's son Paul has taken over as his dealer. Paul Thiebaud has been a successful art dealer in his own right and has eponymous galleries in Manhattan and San Francisco. 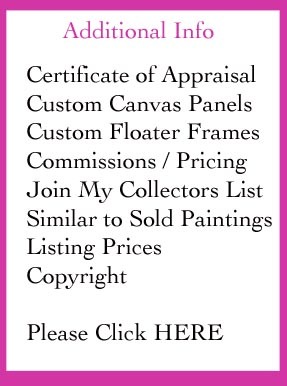 In 1962 Thiebauds's work was included, along with Roy Lichtenstein, Andy Warhol, Jim Dine, Phillip Hefferton, Joe Goode, Edward Ruscha, and Robert Dowd, in the historically important and ground-breaking "New Painting of Common Objects," curated by Walter Hopps at the Pasadena Art Museum. This exhibition is historically considered one of the first Pop Art exhibitions in America. These painters were part of a new movement, in a time of social unrest, which shocked America and the art world and changed art forever. He was associated with the Pop art painters because of his interest in objects of mass culture, however, his works, executed during the fifties and sixties, slightly predate the works of the classic pop artists, suggesting that Thiebaud may have had an influence on the movement. Thiebaud uses heavy pigment and exaggerated colors to depict his subjects, and the well-defined shadows characteristic of advertisements are almost always included in his work. 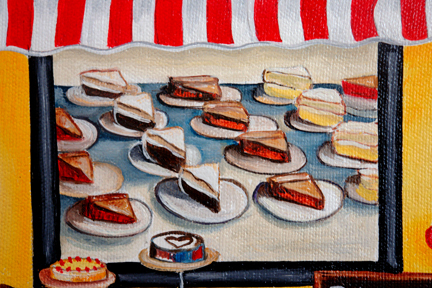 In addition to pastries, Thiebaud has painted landscapes, streetscapes, and popular characters such as Mickey Mouse. His recent paintings such as Sunset Streets (1985) and Flatland River (1997) are noted for their hyper realism, and are in some ways similar to Edward Hopper's work, who was fascinated with mundane scenes from everyday American life. In his painting, he focuses on the commonplace in a way that suggests irony and objective distance from his subjects. He also makes a point of keeping an independent distance from the New York School. What amazing attention to detail! Delish!!!! !